Adventure is perceived by many as an unnecessarily dangerous pursuit in which irrational humans play Russian roulette with their lives and the lives of others. Our 9 day crossing of Bass Strait is yet another relatively insignificant example of how a seemingly “preposterous” pursuit can be achieved with minimal objective risk with the right preparation and planning. The upside can provide an incredible opportunity for experiencing a continuum of emotions and viewing of landscapes and wildernesses that one only thought could be seen in a backdrop for National Geographic. We learnt more about our magnificent planet than could ever be achieved in a lecture or studies. But even more importantly, we grew as humans..
We spent 4 days allowing Jonesy to recover fully before we considered pushing off on our one way journey to Tassie. Our paddle down to Refuge Cove was somewhat uneventful. We enjoyed great weather and a much welcomed tidal assistance which spat us out the mouth of Port Welshpool and guided us down the magnificent coast of the Prom. The kayak was understandably heavy: full of our camping gear, 10 days of food and 30L of water. We had agreed prior to departure to keep the kayak moving whenever we were out on the water. That meant one of us always paddled whilst the other refuelled, kept hydrated etc. This we did every hour. We found these one-man paddling stints excruciatingly heavy, but surprisingly the boat maintained the momentum of at least 70% of the speed that the two of us would usually move the kayak. 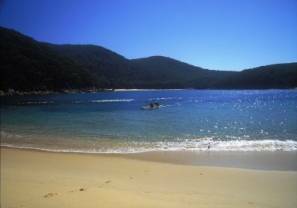 Refuge Cove was our first of many campsites in paradise. Fortunately, we arrived there with plenty of afternoon daylight allowing us to swim, look around and delve into deep thought regarding the much anticipated crossings that we now immediately faced. Because of the limited room in a double kayak, we took Bivvy bags rather than a tent, allowing us to drift off to sleep counting the shooting stars. Drifting off to sleep at Refuge Bay, we knew from the weather forecasts that our first island crossing was not going to be blessed with the weather of the current day. 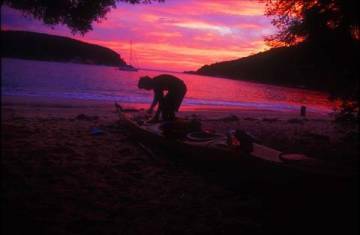 We awoke under the veil of darkness so that we could pack the kayak and be moving at first light. One concern with this initial stretch of water is the traffic from container ships. It was imperative that we could see these predators as soon as they appeared on the horizon. Violently the sky broke into bloody red streaks as the sun woke from its slumber. We looked at each other knowing the classic sailors’ axiom: “red sky at night, sailors’ delight, red sky at morning, sailors’ warning”. After receiving a weather update from a sailor seeking refuge in the bay and as we paddled away from the mainland, low cloud hid the higher peaks which slowly receded behind us, creating a Jurassic Park-like aura. There was little idle chit chat between us, as full concentration was required in order to deal with the choppy conditions. A good one and a half hours in which we had no sight of land heightened our senses to the feelings of isolation and loneliness. We paddled round the southern tip of Deal Island to find ourselves hidden from the Southerly wind that had been caking a nice crust of salt down our left-hand sides. Although there are no trees on Deal Island, the birdlife, penguins and the general elation of being on our own island was magical. Our tranquil little cove at the hut became a cauldron of froth with a slight change in the wind direction. The exit looked dangerous, and the idea of paddling into a strong headwind wasn’t the most appealing prospect. We spent the day exploring the island. After a day out of the kayak, it is amazing how rapidly the body adapts to the stresses of paddling. Both of us felt much stronger (it wouldn’t have anything to do with us eating all our food supplies, surely!) after our rest day. The topography of the Kent Group was a violent contrast to that of Deal Island in that it was covered in a thick blanket of shrubs and trees. We walked 8km return, up a well-marked track to obtain water from the caretakers who were very welcoming, inviting us in for a cuppa and a good chat. Apart from our friendly caretakers, on both the islands that we landed on we were most welcomed by the local inhabitants. The penguins, wallabies and vast array of birdlife ensured that there was never a dry nor lonely moment. I heard Jonesy mutter as we awoke with nervous trepidation about our biggest 65km crossing. We knew there was a cold front expected the following day, bringing gale force weather. We were anxious to seek refuge at Killiekrankie – a small fishing village with a population of 15 on the northern tip of Flinders Island. After obtaining a weather forecast over our satellite phone at 6am, further assurance was provided that we should have our window to get to the relative safety of Flinders. 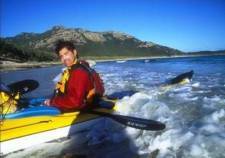 We started paddling on our bearing of 1240 with no sight of land ahead. Hour after hour passed, as our umbilical cord with Deal Island was slowly severed, leaving us more and more exposed. We were alone. It was quite a humbling experience sitting in a primitive kayak, surrounded by hundreds of kilometres of ocean, in which their was only a smattering of islands dotted around us. Without our trusty GPS giving us a constant indication of moving speeds, our rate of movement could have been cunningly deceptive due to the havoc that currents and tidal influences can play. Our compass constantly audited our GPS readings in order to keep it honest. Flinders Island slowly crept over the horizon like a division of elite SAS forces advancing on enemy lines. Arriving at Flinders, a wave of relief washed through our veins as we now had the biggest stretches of ocean behind us. We could enjoy the company of people rather than penguins, and experience the foul weather that Bass Strait is infamous for – but with solid footings on land. We holed up in a tiny hut nestled behind the sand dunes allowing us welcome respite from the ever intensifying storm. Spent most of the day sleeping, reading, recovering and looking forward to paddling with the monolithic Mt Strzelecki on our left-hand side down the coast of Flinders. “Wouldn’t go out there today boys”. That was enough. In we went. What right did we have to disrespect 53 years of local knowledge and an adverse weather forecast? As luck would have it, we hitched a ride with that same fisherman to Whitemark (the capital of Flinders with a population of 50) to tuck into a pub meal and have a coupla beers. Only later did we find out that our “free ride” sentenced us to 5 hours manual labour moving the local souvenir shop round the block! With the cold front passed and the OK given by our old mate, we were off down the western Coast of Flinders Island. We battled the strongest headwind of our trip for the first hour, during which I was certain we were moving slower than a penguin waddling on land. “Jonesy, are we still going forward, or are we gonna get blown all the way back to Victoria?” I asked in a most frustrated tone. Although we had strategically timed the ebb tide, we had never witnessed such an absurd contradiction of physics. Somehow, the strong tidal influence was having a drastically greater impact on our progress than the 65km/hr headwind! Then suddenly, gigantic waves appeared all around us and before we knew it, we were crashing through a 4 metre swell. Over one, down another, then over a particularly steep one, the water gave way under me and I found myself and the front half of the boat floating through the air until we crashed into the trough a good 3.5m below. Our Pittarak handled the conditions magnificently, not once did we feel threatened that we would be rolled upside down. And just as rapidly as the conditions engulfed us, they were gone, and we enjoyed a much more favourable situation down the length of Flinders to Trouser Point. We awoke cold to a breathlessly calm morning. As our journey had progressed further south, we definitely found the chill starting to penetrate us deeply. During the day, there was a constant coolness in the air which required us to wear our gore-tex jackets even whilst paddling, and ensured our fingers felt like wooden roots curled around our paddle blades. At Trouser Point we had lit a fire to provide warmth and as well as to cook on, in order to preserve our rapidly diminishing supply of fuel. The nagging chill did not let our bodies efficiently recover whilst asleep, due to the copious amounts of energy that were expelled to warm our bodies during the night. As we started across Franklin Sound, we were blessed with lake-like conditions. There was silence. Was I suffering from the debilitating effects of summit fever? Did Jonesy think that I had been out on the water too long? We had established early on in the journey that if we deviated from our initial plan we must closely scrutinise our reasoning. “Let’s see how we feel in a couple of hours”, he casually replied. Hour after hour went by, in which we found ourselves at a cross-road. Head for land or go direct to Tassie? As conditions remained idle we called our landman to ensure that the Bureau did not expect any adverse weather shifts. The go ahead was given and on we went! Instantly, the tide shifted direction and we found our speed dropping, which had both of us calculating worst possible scenarios… “Even if we drop down to 5km/hr we will still have a buffer of 1 ½ hrs before nightfall, that means we could make it at 4km/hr”. It’s amazing how many times your head can play with different speed, distance and worst case scenarios. 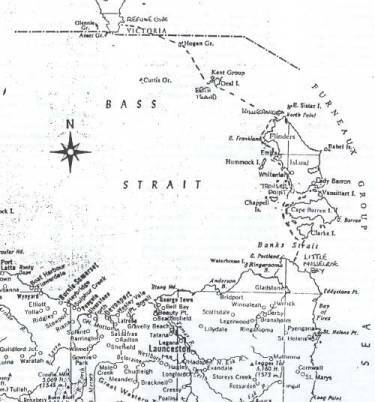 The slog continued and we were forbidden to complain, as stories of this infamous stretch of ocean known as ‘Banks Strait’, are renowned for sinking ships and breeding epics. As Tassie drew closer, the number of birds and penguins in the water grew exponentially. So did our singing… ’14km to go… 1 City to Surf’… “C’mon”…’Once a jolly swagman camped by a billabong…..”. When we were 5km out we knew our judgement had paid off as the tide swept us toward Tassie like a jet coming in for landing. Touchdown! After over 9 hours out on the water we arrived at our final destination. There was no-one waving flags, cheering, or girls in mini-skirts waving pom-poms. But the deep glow of self-satisfaction was infinitely more rewarding than that which could ever have been received from others. 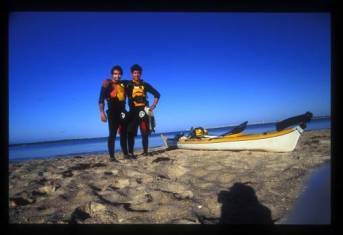 We had paddled 350km across Bass Strait over 9 days wherein we had received little support from friends and family. It was a special moment of reflection to have set a goal for which we were the only ones to actually believe in ourselves – and to have finally achieved it. Communication was established with AMSA, Victorian Water Police and TAS Water Police.